To understand how far the U.S. auto business has been reaching for new customers, consider the early performance of a bond issue called Skopos Auto Receivables Trust 2015-2. The bonds were built out of subprime auto loans and sold in November. Through February, about 12% of the underlying loans were at least 30 days past due, a third of which were more than 60 days delinquent. In another 2.6% of loans, borrowers had filed for bankruptcy or the vehicles had been repossessed. Those borrowers are at the outer fringe of the auto market. Still, the high level of missed payments for loans made so recently is a warning sign for an industry that needs every customer it can get to keep sales increasing at a record pace. The early delinquency rates seen in the debt issue from Skopos Financial LLC, a Dallas-based lender that specializes in loans to people with weak or no credit histories, are in line with those for several similar bond deals from other lenders around the same time. About 12% of the loans backing bonds sold in November by Exeter Finance Corp., another Dallas-based subprime lender, were more than 30 days delinquent through February, according to the company. A spokeswoman said delinquency rates came down from the previous month. Loan payments have been slipping as well for the broader group of subprime borrowers who make up a big slice of the auto market. The 60-plus day delinquency rate among subprime car loans that have been packaged into bonds over the past five years climbed to 5.16% in February, according to Fitch Ratings, the highest level in nearly two decades. The rate of missed payments is higher for loans made in more recent years, a reflection of more liberal credit standards and the larger number of deals from lenders serving less creditworthy customers, according to Standard & Poor’s Ratings Services. Investors are becoming concerned. Flagship Credit Acceptance LLC, another small lender, recently had to offer higher yields than expected to sell bonds backed by subprime auto loans. Flagship declined to comment. “What’s driving record auto sales is not the economy, but record auto lending,” said Ben Weinger, who runs hedge fund 3-Sigma Value LP in New York and who has bearish bets on some auto lenders. He said demand for auto debt has led lenders to systematically loosen underwriting standards, which he predicts will result in higher loan delinquencies. 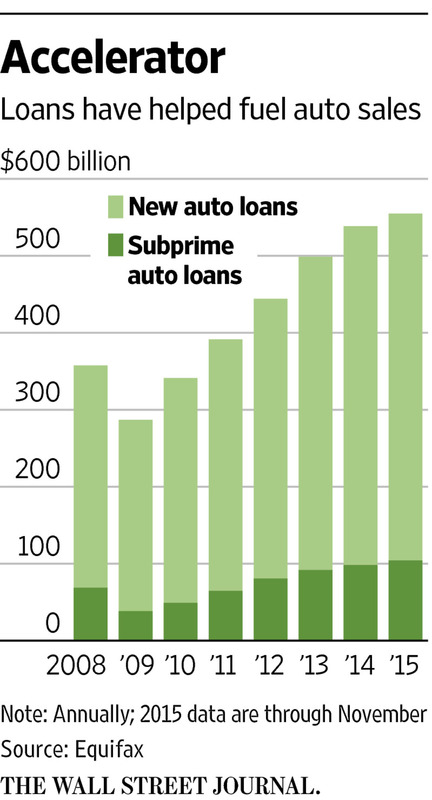 Most analysts have shrugged off talk of a subprime auto-loan bubble. They said the economy isn’t in recession, unemployment rates are fairly stable and low gasoline prices are putting more money in people’s pockets. The U.S. auto industry has been on a tear. Sales of new cars and light trucks came in at a record 17.5 million in 2015, and the strong pace has carried into the new year. Sales of used cars, which a majority of subprime borrowers purchase, also are increasing, according to the National Automobile Dealers Association. The total volume of U.S. auto loans is now at an all-time high of close to $1 trillion, with a fifth made to subprime borrowers, according to Equifax. Many of those loans are repackaged into bonds to free up capital so that new loans can be made. Issuance of bonds backed by U.S. subprime auto loans topped $27 billion last year, the highest in a decade and up 25% from 2014, according to Asset-Backed Alert, an industry newsletter that has flagged concerns around Skopos and other “deep subprime” lenders. Skopos sold its first bond deal backed by pools of subprime loans in April. The company’s second deal was the November transaction, which raised $154 million. The bonds are backed by more than 10,000 loans, with terms averaging 5.6 years and interest rates of about 20%. Some 87% of the loans were to borrowers with credit scores below 600, on a scale of 300 to 850. A third of those had scores below 500 or no credit scores at all. Before making loans, Skopos said it verifies information, including borrowers’ employment and whether they actually made cash down payments. For those with no credit score, it looks at alternative metrics, like how they pay phone bills. “We interview every customer before we fund the loan,” Skopos CEO Daniel Porter said, adding that individuals with no credit histories are often young working adults who are more motivated to keep making payments. The lender and the credit-rating firms involved in the November transaction said the deal’s performance so far is within expectations. They said some borrowers likely overspent during the year-end holiday season and should become current on the loans after receiving tax refunds. Delinquency rates fell from January to February as that trend is starting to play out, according to the company. Representatives of Kroll Bond Rating Agency Inc., which gave most of the bonds in the November deal investment-grade ratings, said the securities are structured so that half the loans in the pool could default and all the bonds still would be repaid, while the lending company absorbs the losses. The high interest rates on the loans are expected to cover any losses from people defaulting. “We don’t see anything at this point that causes us concern,” said Eric Neglia, a senior director. The auto market might. After last year wrapped up with record sales, some analysts began worrying that a top could be near. Shares in Ford Motor Co. and General Motors Co. have fallen this year. Sales surged in February, but analysts still worry the industry is starting to rely more on incentives. Loans have been crucial, too. Nearly nine out of every 10 new cars and more than half of all used cars are financed, according to credit-reporting company Experian. Most auto lenders, unlike subprime mortgage lenders of years past, hold some risk from the loans they make, so they have little incentive to make bad loans.